Thread holds the fabrics and everything together when you’re sewing. You may think that there is no difference in thread, but the best sewing machines actually depend on the quality of thread. If you’re having problems with the sewing machine, the first thing to check out and change is the machine needle. If problems still persist, then you might need to evaluate if you’re using a good quality thread. 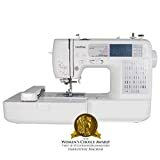 Most new and top rated sewing machines have tension disks that can be damaged when you aren’t choosing quality thread to use it with. 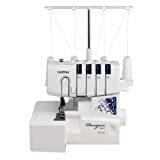 There are a lot of helpful sewing machine reviews where users recommend their own type of threads. Cotton threads are suitable for sewing projects involving cotton, linen and rayon. It is the thread of choice of many seamstresses due to its softness, flexibility, durability and wide range of color choices. It works best for delicate fabrics like lingerie. This type of thread is also known for heat resistance, so it is great to use with pieces that would later need to be pressed with clothes iron. There are many types of cotton thread in the market – some have relatively rough texture, and some have a smoother finish. One type to avoid for use in machine sewing is the glazed cotton thread, which is waxed and treated for a lustrous appearance. The glaze from it can rub off and clog up machines and sewing needles. Known as a multi-purpose thread, polyester is a great choice for most sewing projects, both machine and hand-sewn. Polyester is a little more elastic than cotton threads, making it perfect for sewing synthetic fabrics, knitted fabrics, and fabrics that are a bit stretchable. This material is also chosen for its strength, durability, low stretchability and low shrinkage. Regular or all-purpose thread is typically used for general sewing. Extra-fine is for machine embroidery and lightweight fabrics. For other embroidery projects, also consider using high-sheen polyester thread to give it a rich appeal. A cotton-covered polyester is a good if you want the appearance of cotton and the strength of polyester. Meanwhile, extra-strong is used for heavyweight fabrics, carpets and buttons. Nylon is picked as a thread because of its light weight, flexibility, strength and durability, making it perfect for sewing heavy fabrics. This thread is usually used for sewing activewear, leather goods, handbags, shoes and upholstery. It also suits sewing projects that use vinyl, canvas, fleece, suede and tricot. Nylon thread comes in different types. If you need to sew a bathing suit, a dance costume and other garments using spandex and Lycra, it’s best to use a woolly nylon thread. But if you’re working on draperies, wallets, luggage, tarpaulins and plastics, consider using a high-quality bonded nylon thread. Silk threads are made of natural silk fibers. A silk thread is very fine, so it won’t leave holes on fabric, making it an excellent choice for sewing very delicate fabrics like silk or wool. It’s also good for basting thread. Although this is a very fine thread, it is also durable. People usually don’t use this thread regularly because it is expensive. You won’t be using wool thread a lot when sewing garments. This type is often used for embroidery projects, but it is also perfect for sewing heavier fabrics like canvas, linen, lightweight denim and wool, of course. Wool thread is also a good option for topstitching. You only need to use a larger needle and adjust the sewing machine’s tension properly. Metallic thread is usually made of polyester with a metallic sheen. This thread comes in wide range of colors, typically in silver, gold and copper varieties. It’s a great choice if you’re looking for a thread with a little shimmering effect for topstitching. This type of thread is often used in machine embroidery and in decorative sewing, usually seen in handbags and other fashionable items. Buy the best you can afford. Cheap thread would give you low quality, and it will ultimately show on your garment. You don’t want a weak seam on your clothes. Match the thread content to the fabric content. Use cotton thread for natural fabrics and polyester thread for synthetic blend fabrics. Carry a sample of the fabric you’re going to work on before going thread shopping, especially if it is printed and patterned. There is no single right color for every fabric – the choice is yours. Buy enough thread to last for your sewing project. You don’t want to get run out of thread while you’re still working on you project only to find out that there’s no more thread of the same color in your nearest store. Always keep threads of basic colors (black, white, gray, brown, red, etc.) at home, preferably in big spools if you’re a frequent sewer. One spool of thread is usually enough for most tops and skirts. For dresses, gowns and other elaborate garments, you may need two. Threading the machine before sewing would help prevent thread breakages while the machine is in use. Store your thread away from direct sunlight to avoid discoloration and fading.